In my previous post I connected two Arduino’s using the I2C protocol. This was a good test for me to understand the I2C communication. My initial goal was to connect a Raspberry Pi to one or more Arduino’s. Why? Plain Arduino’s lack the ability to connect to the Internet. But they are terrific in reading sensors. They can read them in near real-time and convert raw data into something meaningful. A Raspberry Pi lacks the ability to communicate using analog ports and it is considered slow (having a full OS like Raspbian or Windows 10 means that it just has too much on it’s head). But it is good in communication to the internet (read: Cloud; read: Microsoft Azure) and it has lots of memory. So it is a very interesting architecture to attach multiple Arduino slave to the same Raspberry Pi master. We create our own gateway. 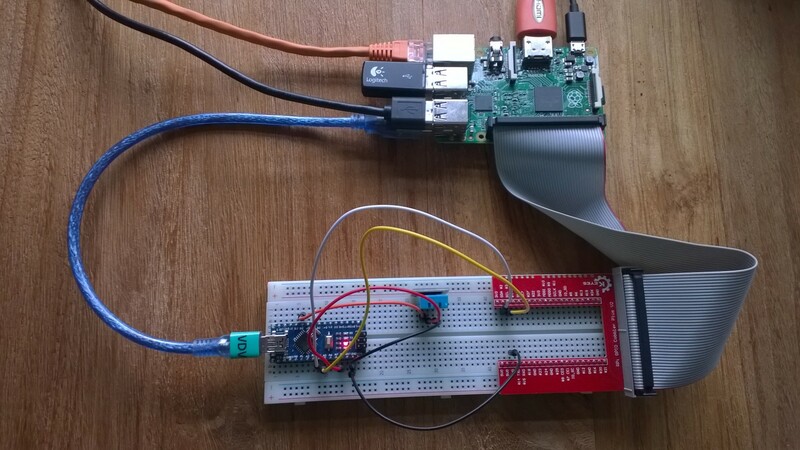 This way the Arduino’s can collect interesting data using low cost sensors and the data is represented in a nice Windows 10 IoT Core dashboard app (The RPi has a HDMI connection after all) or sent the data to a Azure Iot Hub. In my previous post I showed that it is possible to send a question (‘T’ for temperature and ‘H’ for humidity) to a certain Arduino (a slave address was provided) to receive the sensor data. State = "No I2C bus found"
The I2C communication in written into a fairly simple method. This way it is very easy so send a message to a slave and receiving the response. A few weeks ago I bought myself a collection of Arduino sensors, hoping I could use them directly on my Raspberry Pi. But I had forgotten that the Rpi does not have any analog ports so half of them were useless… for the Rpi. 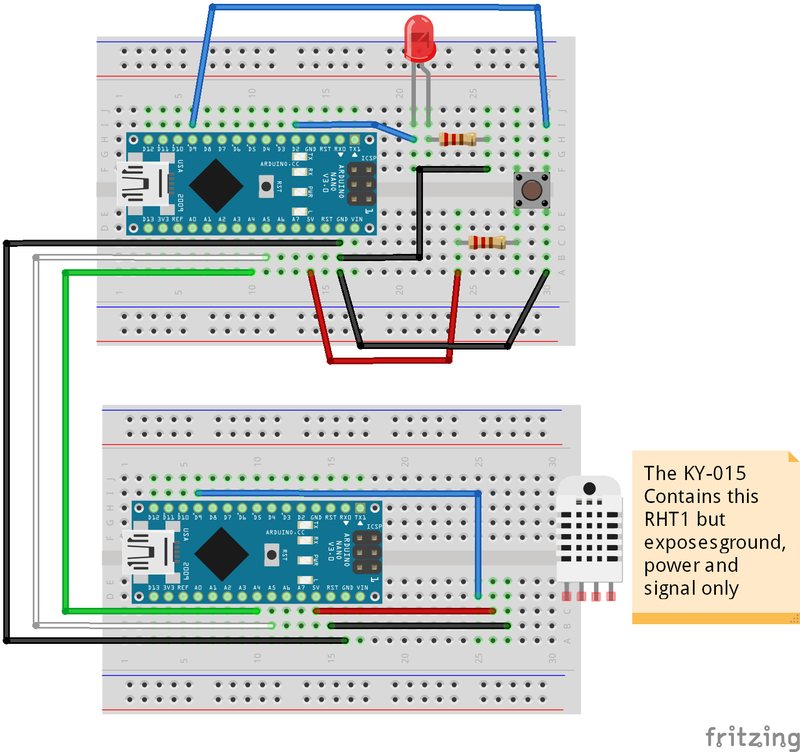 For example, the Ky-015 Humidity and Temperature sensor for Arduino is a nice temperature and humidity sensor but it can not be used in conjunction with a Raspberry Pi. But in my collection of IoT devices, next to the Raspberry PI 2B’s, I also have a couple of Chinese Arduino clones to play with. So I was thinking, what if I use an Arduino to read the sensor information and then connect my Rpi to it to do some internet stuff with the information collected by the Arduino. This is a very common scenario called a Gateway. The Rpi is slow but can communicate very easy with the internet (and it can hold an SSL key 🙂 ). And the Arduino is reading data near real-time but it has limited capacity for the program logic. And the nice thing is that they both understand I2C, a protocol to communicate between devices. It works with master-slave relationships and the devices are connected by only two wires (and a third one but that’s just the ground wire). That’s easy! The upper device is an I2C master has a button and a led. The lower is the I2C slave and holds the sensor. Master and slave are connected by the Black, White and Green wires. Warning: Why is there no Rpi involved? First I wanted to be sure I understand I2C. Second, connection a Raspberry Pi and an Arduino is not without the danger of frying one or two devices (A Rpi is operating at 3.3 volts and an Arduino at 5 volts). I have seen documentation in which is stated that it can be done as long as the Rpi is the master. The idea of this experiment is that when the master button is pushed, both the extra led and the internal led are lighted and a character (H for the humidity of T for the temperature) is sent to the slave. And the slave responds with the requested data. 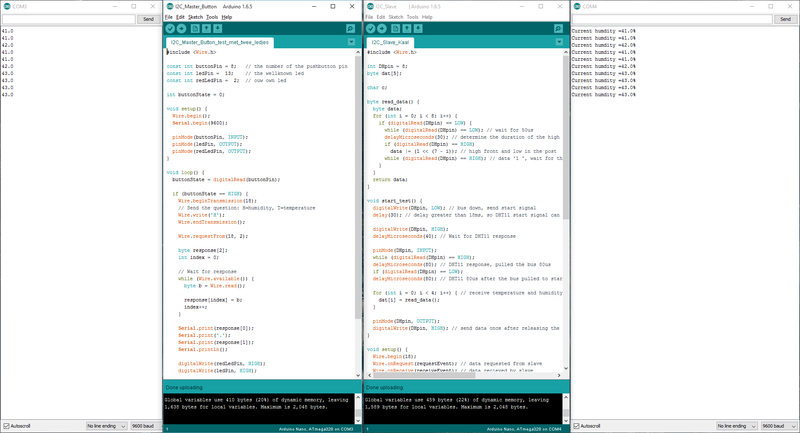 I use the serial port monitoring to check out the communication (part of the Arduino programming environment). To make I2C communication extra easy, check the wire library. This makes I2C communication very accessible on the Arduino and the examples are good enough for the first experiments. Do you use another kind of Arduino, please check out your own pinout diagram! I first send a character and then I wait for the response (two bytes). I communication with the slave at ‘channel’ 18. I2C makes it possible to communicate with multiple slaves, one at a time. So in theory, I could also check out another nano which is serving another sensor. The slave is just checking the sensor, every second. Meanwhile, two callback functions can handle an I2C data received event and I2C data request event. First, we receive the character (H or T) which we store in a local variable ‘c’. Next, we are asked for the answer so we check the local variable ‘c’ and answer with the right data. And as you can see, the data is exchanged as expected. This gives the confidence to start communication between my Rpi and an Arduino Nano.